So you are considering buying a beach house or condo in Panama City Beach? What could possibly be horrible or horrific about that? Well absolutely nothing, almost. 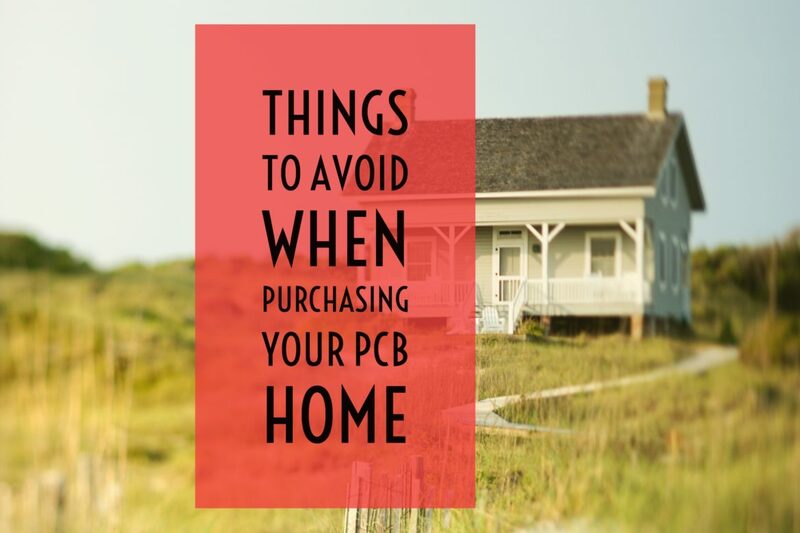 This is a list of red flags to avoid that is really relevant to buying a new home anywhere but would be particularly obnoxious when you have finally arrived at your beach home and are expecting to exhale with a pina colada in hand (or margarita, depending on your personal preference). Don’t buy a piece of real estate before taking a glance (and listen) around at the neighbors. Unfortunately, they come with any new property and last time we checked, you can’t renovate them if they irritate you. Are they loud, unfriendly? Do they have a dog that they let bark constantly or an unkept yard or balcony? It’s pretty awesome to have a condo on the 28th floor looking out at the ocean but not if you can hear your neighbor’s Rottweiler barking to go on a walk every three hours. That is not a recipe for a relaxing and happy vacation spot. Have your realtor help you check to see if there are any outstanding liens on the property. This can be done at the county clerk, recorder or assessor’s office (and in some cases, online). If there are liens, then they need to be remedied before you purchase the property. This should be taken care of with the title, but it never hurts to check at the outset in hopes of preventing hurdles and time delays further into the purchasing process. Also consider looking to see if any suits have been filed against the property builder or condo association. Even if a case has been settled or closed, it will still apprise you of potential issues such as chronic leaky windows. It’s easy for a seller to repair and paint over damaged areas for the purpose of selling a property so it’s good to have a heads up if there is something specific you want your inspector to look for. Last but not least, it’s easy to be swept away but granite countertops and updated bathrooms, but it’s important to also take notice of community areas in a condominium building. Community areas are also part of what you are purchasing and will be associated with your property (and your enjoyment of it) for as long as you own it. Is trash being disposed of in a timely and appropriate manner? Is the outside of the building in good repair (no peeling paint, rust or signs of water damage)? These are important issues that can drive down your property’s resell value down the line if not attended to. Take the time to investigate them now as well as the steps that are typically taken to remedy any issues. Also, your realtor should help you review the rules of your condo association as well as the HOA fees you are obligated to pay to address such upkeep requirements. Using a knowledgeable and experienced real estate group such as Life’s a Beach Real Estate can help you navigate through some of these red flags when purchasing a house or condo in Panama City Beach. We know the Panama City Beach real estate market well and are looking forward to helping you find your dream home successfully!